Ladies and gentlemen, welcome to Wenzao Ursuline University of Languages. Standing behind this podium, which quite matches my tiny figure, I understand clearly I have to fulfill your expectation for a university president with a vision from high. Wenzao is not great in seize, but its glory and heritage truly make me feel big in my mission, and not surprisingly, I’ve already felt big in my headache now. Right in front of you is not the main focus of today’s ceremony but only a representation of Wenzao University. You have come here for the reasons that this is our alma mater, that this is a university fully dedicated to education over the years, and that this is a place where excellent students are nurtured for our society. Like you, I welcome this brand new day for Wenzao, suppressing my nervousness. Please allow me to modify the words of US President Donald Trump in his inauguration speech, “This is your day: This is your celebration, And this, [Wenzao, is your school], …So I invite everyone of you, to tremble with me so I won’t feel nervous in delivering my speech, and I also invite you to trumpet with me for Wenzao, that we are launching a new page. On this special occasion, I would like to share my feelings and my thoughts on Wenzao’s mission. First, I am grateful for having been born in a Catholic family. My parents offered such precious opportunities for me to study in Catholic schools ever since my childhood that the influence lasts till today. Although I may have lost my path sometimes, I still keep my faith. Although I may act recklessly, I still adhere to justice. Although I may find myself limited in capability, I am still able to regain my strength to continue. Second, I would like to thank the Ursuline sisters, my teachers, classmates and colleagues. I am very fortunate that most of my years have been spent on the Wenzao campus with you all. The sisters and the faculty are my guardian angels, while my colleagues and the alumni, around 30,000 in number, are my strongest allies. I know in the depth of my heart you will roll up your sleeves to assist me in my work, but I also anticipate your supervising me with a whip of sincerity. If I succeed, it will be a success of joint efforts, but if I fail, I must say, it could only be my personal responsibility. Whatever the case, during my four years of office, I will have the comfort of knowing every Wenzaorian is on my side in my every move. Also I appreciate the chance of having been inspired by Ursuline education, so that I have been able to follow the steps of St. Angela to cultivate the young people on campus. Blessed by the acquaintance with the Christian Service Community, which demonstrates efficient management, solid ties and mutual support to reach the sacred goals, I am able to act more prudently and live humbly in Christ in my search for the Lord. Taking over the heavy load of the presidency, I will do all that is possible “to love the Lord” as instructed by St. Angela. To my understanding, I am only a vessel and a tool, because only the Lord is our ultimate goal. Therefore, when the time has come for me to lead our faculty and students, I devoutly pray to the Lord to grant my team and me the blessings of wisdom, vision, courage, perseverance, prudence, integrity, peace and health. Here I make my promise that I will never disappoint you in my work as I will follow St. Angela’s teachings, and with the Lord’s grace, there will be thriving results. In the next four years, our team will continue on the foundation of our former presidents by both “inheriting and advancing” the development to realize the motto “we do ordinary things extraordinarily well”; namely, we vow to be “unreserved in dedication and peerless in excellence.” In our four-year strategic planning, we propose accomplishments through “integrating, regenerating, and innovating” as our substantial approach. Ever since I came to Wenzao, I have experienced different stages as a student, a teacher, an administrator, and currently as the President. These stages not only have constituted the major part of my life but also have been woven into the developmental history of Wenzao University. We must integrate the essential features of these stages in order to take hold of our core values and directions. The role of Wenzao is clearly defined; we are and have been an international Catholic university of foreign languages for over 50 years. In our consistent development either from a junior college to a full university or from foreign language expertise to cross-disciplinary approaches, we have confronted fierce competition in student enrollment with the booming number of Taiwan’s universities, as well as challenges to switch from academic professionalism to fit into industrial tracks, or from IT to AI. Struggling with the drastic changes in the environment, we may no longer be able to stay passive or remain superficial in dealing with problems. If possible, I expect to work hand in hand with every college and every department, with every staff member in the administration, every faculty member and student, and with every alumnus and partner to forge Wenzao into a leading university in Asia for language application and teacher training, by providing a learning and service mode that integrates foreign language instruction, humanities and social care, IT application, community service, with features on international collaboration and mobility. We aim at a more responsible attitude to devote ourselves to our nation and our city by cultivating bilingual teachers in foreign language teaching, and talents in cross-cultural communication and management and cultural industry. In this way, we will be able to integrate Wenzao’s future with its roots. Is a 50-year-old human being regarded as old? In our Chinese expression, education is a career of a minimum of a hundred years. By this standard, Wenzao is still brimming with youthfulness. More importantly, Wenzao should never lose its zest for life and vitality. What I have in mind is to raise the awareness that we are still young and that we have no right to remain in a state of inertia. When the bugle calls, we should be the pioneers, charging forward instead of lagging behind like the feeble or the senile. 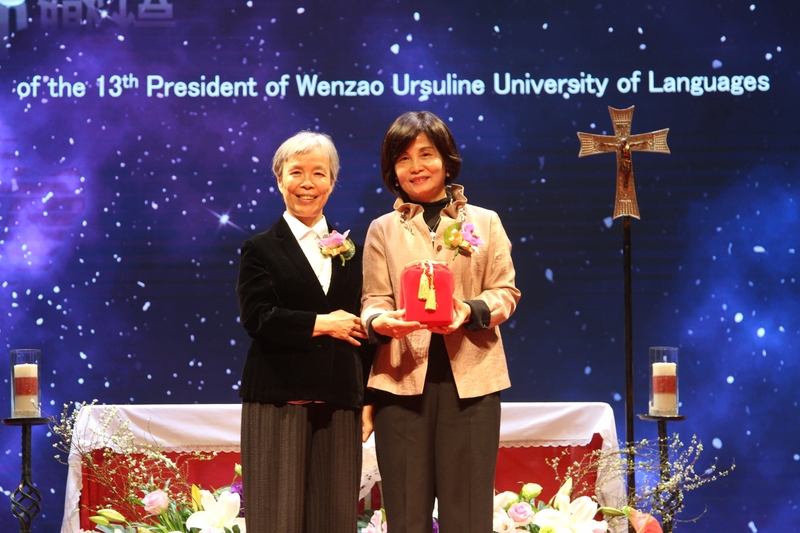 Please allow me to remind you of Wenzao’s 3 Ls: Life, Language, and Leadership, adopted from the core values of Ursuline education. The first L is “life” referring to life education. We accompany students and care for their well- being in their physical, emotional and spiritual growth. The second L means “language” with which we nurture the cultural depth of students in western and eastern traditions and make them the interface for cross-cultural communication. Above all, the final L for “leadership” is modeled after “Serviam” of Ursuline education, a conviction in which we firmly believe, namely, to cultivate true leaders through service. Therefore, I invite provoking thoughts from every faculty member and student here. What changes can be made to the teaching materials that we have used over the past 50 years? What alternatives can be created out of and cross over the field of education, which we have indulged in for half of our life? Are we able to move out of the ivory tower to seek more links with local communities, international businesses, NGOs and organizations for the less privileged? These practices not only vitalize our modes of teaching and service in the perspectives of curriculum, internship, and employment but also consolidate feasible approaches to fulfill Wenzao’s university social responsibilities. Dating back to the early days of a women’s college, to a junior college of foreign languages, to a four-year college, and finally to a full university, Wenzao has actually spent 50 years in its growth. The next 50 years will be the stage of a new Wenzao, whose starting point is the current university status. In other words, its mission no longer aims at growth but achievements. Nevertheless, growth is one of the achievements. Yet, what lies across in our front is not the structural change from junior college to university but developing solutions to collaborate with other universities, to meet the demands of technological trends, to inspire with a vision and empower the digital generations in their performances, and to form brand new bonds with local communities. Take for example Wenzao’s greatest glory, our alumni. They are our most treasured assets. For years, they have cared about and supported their alma mater, performing all possible functional roles that most people expect. However, they can go beyond their current contribution. As we all know, every nation is endeavoring to promote international exchange in culture, economy, and talents through language teaching in order to strengthen national development. Examples include the Goethe-Institute of Germany, ERASMUS of the European Union, and the Confucius Institute of China. In light of this, the future Wenzao Alumni Association will be the best international platform for such exchanges. Through the global network of Wenzao alumni we will be able to establish an outstanding Wenzao alumni academy of international lectures following the heritage of Wenzao’s spirit. Not only will it offer opportunities to Wenzao faculty and students for learning, for further studies, and for internship but it will also link the strengths of alumni around the world and integrate professionalism in various fields to create a platform for international exchange and cooperation for our nation and our city. This is exactly the new mission of a new stage. To sum up, this should be the dialogue between former Wenzao and New Wenzao. Thank you all. I love Wenzao and I wish you a happy Chinese New Year.